PURPOSE: To evaluate the impact of the lens aberrations on the adaptive optics visual simulation of pseudophakic intra­ocular lens (IOL) profiles. METHODS: In 20 right phakic eyes, lens higher order aber­rations (HOAs) were calculated as the whole eye minus the corneal aberrations. Visual simulation using low and high contrast corrected distance visual acuity (CDVA) testing was carried out with the VAO instrument (Voptica, SL, Murcia, Spain), considering three optical conditions of the lens: re­moving HOA (no lens-HOA), removing spherical aberration (no lens-SA), and with lens HOA (natural condition). 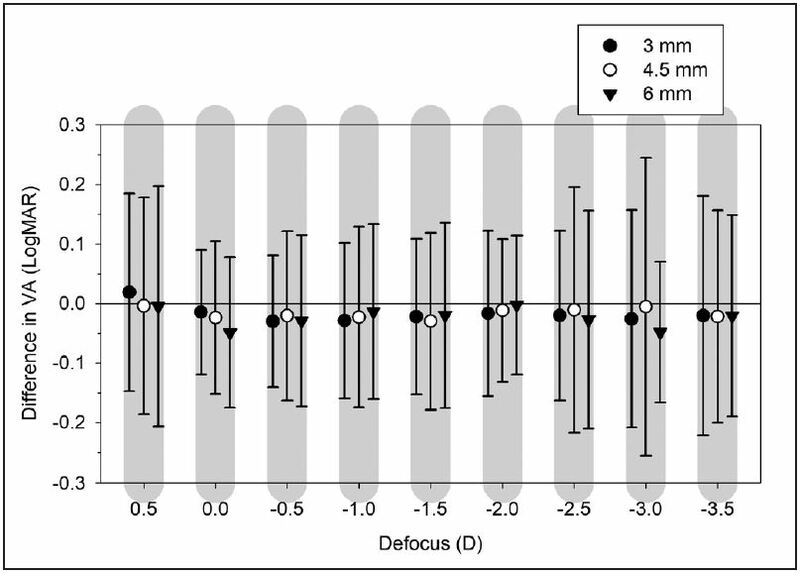 In addi­tion, a through-focus visual simulation of a trifocal diffractive IOL profile with high contrast CDVA was also measured in two conditions: no lens-HOA and natural condition. Three different pupil sizes (3, 4.5, and 6 mm) were tested for all conditions. RESULTS: There were no significant intersubject differences between the three optical conditions and in the IOL simulation for all pupil sizes (P > .05). For 4.5- and 6-mm pupils, mean VA values of the no-lens SA and no lens-HOA conditions were similar and slightly worse than those of the natural condition. 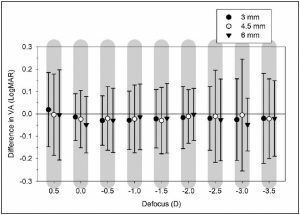 Individual differences between the no lens-HOA condition and the other two optical conditions, estimated as 95% limits of agreement, were acceptable for 3-mm pupil but worse as pu­pil diameter increased. CONCLUSIONS: The effect of lens aberrations on visual simu­lation is imperceptible for a small pupil diameter of 3 mm. Al­though the increment of pupil size increases the probability of patients with significant visual impact of lens HOAs, the mean intersubject VA differences are negligible.